But cultivating blueberry plants at home can be a very tricky proposition. Vijai Pandian, a University of Wisconsin-Extension Brown County horticulture educator, discussed the challenges and optimal approaches to growing blueberries in a Feb. 8, 2014 presentation at the Wisconsin Garden Expo, recorded for Wisconsin Public Television's University Place. "Blueberries are not like a trial and error crop," Pandian said. "It is very picky on what kind of soil it requires and how it wants to grow." The high pH soil present in many parts of Wisconsin is inhospitable to blueberry plants that thrive best when levels are more acidic and below pH 7. Although soil that is slightly above the ideal range can be adjusted over time by applying peat and acidic fertilizers like elemental sulfur, growing blueberries in containers can be a more expedient way to achieve and maintain optimal soil conditions for these plants. A successful blueberry harvest begins with the careful selection of cultivars based on several criteria, including plant longevity, eventual plant size, yield and flavor preference. Many blueberry cultivars are available, and each offers distinct advantages and shortcomings. Northblue, a self-pollinated cultivar, has a desirable taste, but may exhibit slow growth and low yields. Another, St. Cloud, is cross-pollinated and can grow rapidly and deliver high yields, but it has a very mild taste. Once blueberry seedlings are chosen, appropriately sized containers can be selected. Containers should be a minimum of five gallons in volume, and light in color to reduce heat stress. If possible, starting a plant off in a larger container can reduce the need to repot after a year or two of growth. Containers should be placed in full sun, but away from buildings and other sources of radiant heat. Blueberry plants grown in containers require precise conditions to grow and fruit. Gardeners who grow blueberries in soil must often contend with suboptimal composition and conditions, but container cultivation offers an opportunity to customize a combination of soil-less media. Such materials may include peat, pine bark, perlite or shredded coconut core. The mixture should be packed lightly around the plants' delicate roots and thoroughly soaked after transplanting. Although blueberry plants growing in containers will generally need to be watered at least once a day during hot, dry weather, it is important to select vessels with sufficient drainage. "They are very prone to heat and moisture stress issues, so frequent light watering is absolutely essential in blueberries," Pandian said. "They don't like standing water either — that could be a number one killer." After the plants' first year, which is non-productive for the fruits, harvest season usually runs from late spring to late summer. Blueberry plants require the application of both slow- and fast-release fertilizers at various intervals, beginning in early spring. All fertilization should cease in mid-July, when the plants begin to store energy for the following year's growing season. Blueberries are believed to offer a host of health benefits. Around 80 calories per cup, they are low in sodium and cholesterol, high in dietary fiber, and contain roughly 25 percent of the recommended daily value of vitamin C. They also contain ellagic acid, which has been observed to inhibit some cancer cells in laboratory conditions. Other compounds in blueberries have been studied by the U.S. Department of Agriculture and shown to prevent urinary tract bacteria formation, reduce the effect of glaucoma, improve memory and diminish inflammation. Native to North America, blueberries are one of the most popular crops in the United States. Per capita consumption doubled between 2000 and 2012, and production grew from 293 million pounds to 452 million pounds over the same period of time. While growing blueberries in containers offers many benefits, the resulting yields are usually lower than bushes that have been permanently planted in the ground, depending on the cultivar. 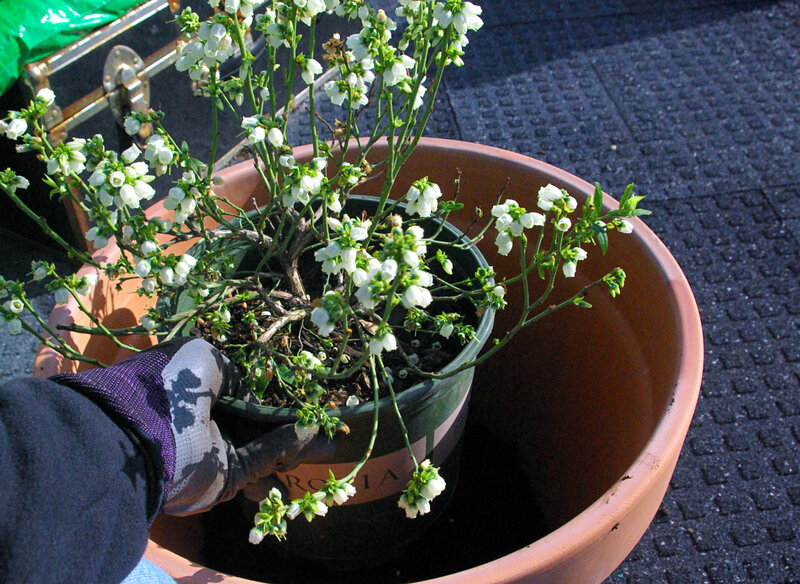 Additionally, the lifespan of a container-grown blueberry plant is often much shorter. A typical blueberry bush requires exposure to temperatures between 35°F and 45°F for 800-1000 hours in order to successfully produce flowers and fruit during the following growing season. Loosely burying the container that houses a blueberry plant can help shield its roots from heat stress while granting control over media mixture, maintaining portability and preventing the encroachment of weeds and pests like the blueberry maggot fly. Blueberry plants require both fast- and slow-releasing fertilizer for optimal growth. Slow-releasing fertilizer like elemental sulfur should be applied four weeks. Fast-releasing fertilizer should be applied roughly every two weeks. All fertilization should cease by mid July to allow the plants to begin developing for the next growing season. Blueberry cultivars that are cross-pollinators require a second plant for fertilization and fruit formation. Self-pollinating cultivars do not require any additional plants, but may produce larger yields if cross-pollinated. Wisconsin Public Radio's The Larry Meiller Show interviewed Pandian on January 27, 2017, when he discussed techniques to achieve the ideal conditions required for blueberries to survive and bear fruit, and avoid the exercise in futility that gardeners may experience with Wisconsin's varied soil types. On Wisconsin's soil acidity: "Unfortunately, everyone doesn't have a perfect acidic soil. You only find in certain parts of Wisconsin — either in the northernmost part of Wisconsin or maybe in the central part. But in most of the other regions in Wisconsin, your soil pH tends to be above 7. In case of [soil pH] above 7, it is not worth battling against Mother Nature by incorporating elemental sulfur." On the difficulty of shifting soil pH: "I had a gardener, she's been amending the soil pH for the past 10 years, and her pH was about 7.3. To drop from 7.3 to 7.2 took her about eight years by using elemental sulfur. And that is not a one time deal at all, actually, because every time you need to sustain the soil pH. So all you're doing with the elemental sulfur is sugar coating it, and the sugar coating doesn't last long in the soil particles." On the advantages of container growing: "If your soil pH is above 7, it's best to grow blueberries in a container... You could be able to control the acidity level very easily. Second, easy to maintain. You don't have to think about if you want to spray for pests and diseases, it's very easy to do it. You don't have to worry about weeding. You don't have to think about if it's going to be too tough to prune or too tough to harvest… The other best thing is it's very portable. Nowadays, people like to have a small space gardening. You don't want to have big, big bushes. So you're growing in containers, if you don't like the spot, you can move to another spot." On the signs of stress in blueberries: "Sometimes you will see blueberry plants — either when you shop around in a garden store or when you plant them, even in the middle of the growing season — the edges actually turn golden brown in color. Those are really a good sign of heat stress and moisture stress. And if it prolongs, [the plant] can get completely toasted." On the danger of late summer growth: "By mid July, the plants will have reached [their] final stage of harvesting. By that time, all the new growth, shoot growth, will all be completely stopped. You don't want to trigger any more of those new growth by adding some of those fertilizers. If you do add it, those new twigs or the new growth will become subjected to winter injuries." On protecting blueberries from wildlife: "It's absolutely essential that you take all kind of precautions to protect these valuable blueberry plants. In wintertime, blueberry becomes very vulnerable to rodent damages, either voles or bunnies. So have a hardware cloth around these blueberry plants, and put up a bird net on top of it too, just to give some protection from the birds as well as from the rodents, because sometimes chipmunks can also climb on top of it and get into it too."